Well, it’s been a busy time and I’m flat out writing a 4th Takeshita Demons book….YAY! This does mean I’ve been massively distracted from blogging (sorry! ), but I do tend to go into my cave when the writing’s really working. Well…enough chest-beating. Time to get back to the real work of WRITING! Cheers for now and see some of you soon! 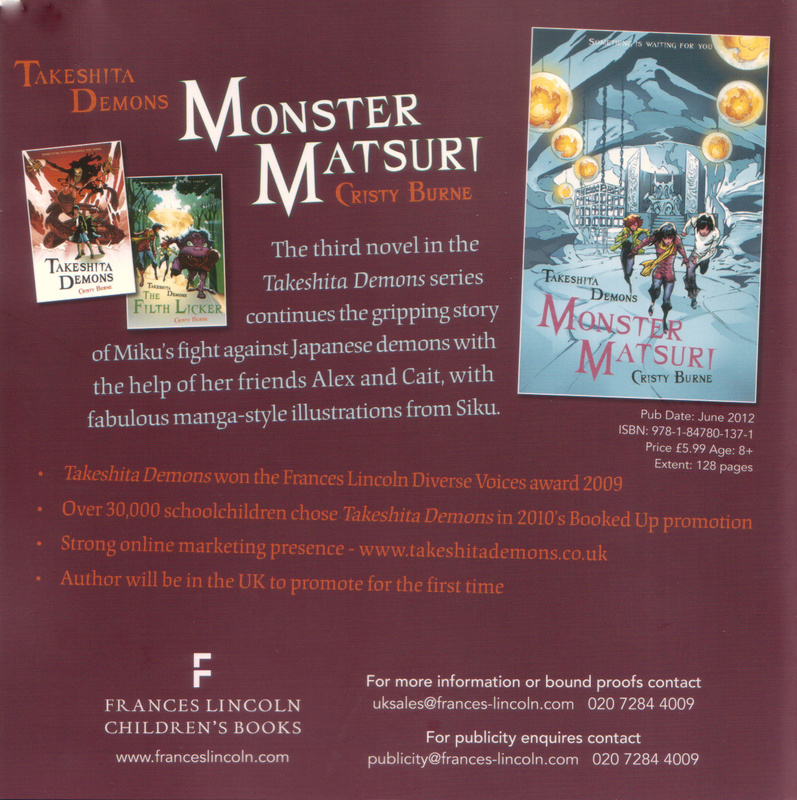 Tags: Childrens Book Week, Frances Lincoln, Monster Matsuri | Permalink. So by now you might already know: the winner of the 2010 Frances Lincoln Diverse Voices Children’s Book Award is Tom Avery with Too Much Trouble. But who is Tom Avery? And what was he doing before the Frances Lincoln Award team got their hands on his manuscript? Well, I’m glad you asked, because…..I’m lucky enough to have the answers!! Thanks to Tom for taking the time to answer my questions while he was preparing for the award ceremony….it’s pretty nerve-wracking, but in a totally wonderful way! Too Much Trouble is the story of two brothers, Emmanuel and Prince. Emmanuel tells us his story as he looks back on how events led to him holding a gun to a man’s head. The story opens on an ordinary day for the boys at school where they strive to go unnoticed, fending for themselves on handouts from their drug-dealer uncle and living in a house where they compete for space with their uncle’s marijuana. But life changes completely when their temperamental uncle decides the boys are too much trouble and withdraws his already limited support. Left to look after themselves, the brothers are led into a life of crime from which Emmanuel cannot see a way out. How cool does that sound!?!?! I can’t wait to get my hands on it. 1) You are going to work as a teacher with a focus on communication and language. Do you have a favourite activity for encouraging primary school kids to love reading? It sounds simple, but reading great stories to children really makes a difference. Children love having books read to them, they get to experience the story without the barriers that might be in the way if they read it themselves. I remember reading ‘Prince Caspian’ to a class, before the Disney film came out, they loved it, and it spurred them on to read the other Narnia books. I had boys competing to be the first to finish all seven. 2) You currently teach a unit called “How much freedom do you have?”: What are your students’ reaction to the themes you work on? Are they interested in freedom, discrimination, equality, etc? Do they see it as relevant to their own lives? Most pupils are completely engaged with the themes that the unit touches on, so much more so than I could have hoped for when I planned the module. We look at religious freedom, through the events of the gunpowder plot, and have long debates about the school holidays based around Christian celebrations, the majority of the pupils are Muslim and are only allowed one day off of school a year for religious observance. We look at freedom of opportunities, through the life and actions of Rosa Parks, growing up in an ethnically and economically diverse city the pupils know all about this. We also look at the way asylum seekers are treated in regards to freedom by studying the wonderful book, ‘The Island’ by Armin Greder, which couldn’t be more relevant to some pupils as they have come to Britain as asylum seekers. The only problem is, the children then start questioning all the things that they’re not allowed to do in school! 3) Had you entered any other competitions before the DV award? Any you recommend? I have never entered a writing competition before. A friend who had read parts of my manuscript ‘Too Much Trouble’ recommended that I enter, I am very glad that they did. 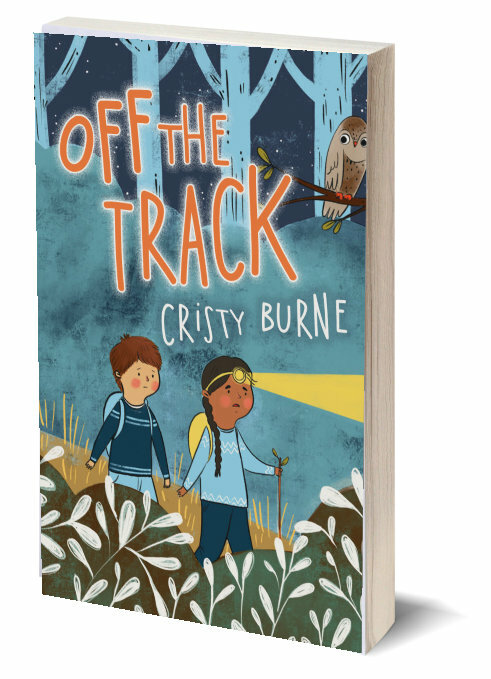 4) Do you think there’s a place for ‘diverse voices’ in children’s literature? What would literature be without ‘diverse voices’? Children read books about children because they can relate to them; they can see a small part of themselves reflected in the story. 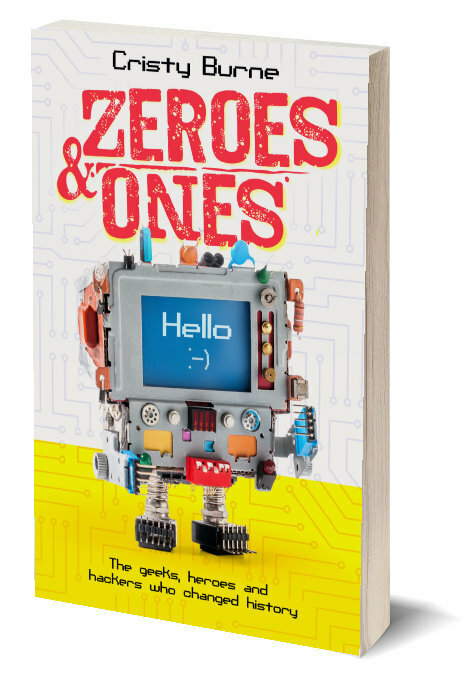 We live in an increasingly multi-cultural and diverse world, particularly in the cities of Britain, and all these diverse children need to see parts of their story reflected in what they read. 5) You and your wife both work after your toddler is asleep. Any tips to other writers who are also parents? Number 1 – Keep writing. It’s very easy to sit down in front of the T.V. after a days work, then playing with, feeding, bathing, dressing and putting to bed your kids. But if your dream is to be a writer you’ve got to keep writing. Number 2 – Prepare to be interrupted. If your children are anything like mine they don’t do what you expect, but that’s why they’re so gorgeous. Number 3 – Marry someone wonderful. My wife is so amazingly encouraging. 6) Is Too Much Trouble your first attempt at writing a book? ‘Too Much Trouble’ is my first finished manuscript. I have started other books in the past, but have always lost confidence at some point, again I point to my wonderful wife’s encouragement for finishing ‘Too Much Trouble’. Geraldine Brennan, a judge of the award, spoke to Tom about what inspired him to write Too Much Trouble. Tom Avery, 26, grew up in Lewisham with two older brothers and a younger sister. He trained as a primary teacher at the University of Greenwich and taught in New Eltham for two years before joining Queensbridge School, a performing arts college in Moseley, Birmingham. In September he will start a new job as co-ordinator of English, communication and language at Torriano primary school, round the corner from Frances Lincoln. How did you start to write and what helped you? I have wanted to be a writer since the end of primary school but I always lacked the confidence to get beyond the first few chapters. My wife Chloe encouraged me to stop talking about the story that was in my head and put something on paper around the time we had our son, who is now 15 months old. She is a freelance fashion designer and we both have to wait until Caleb is in bed to focus on our own work. 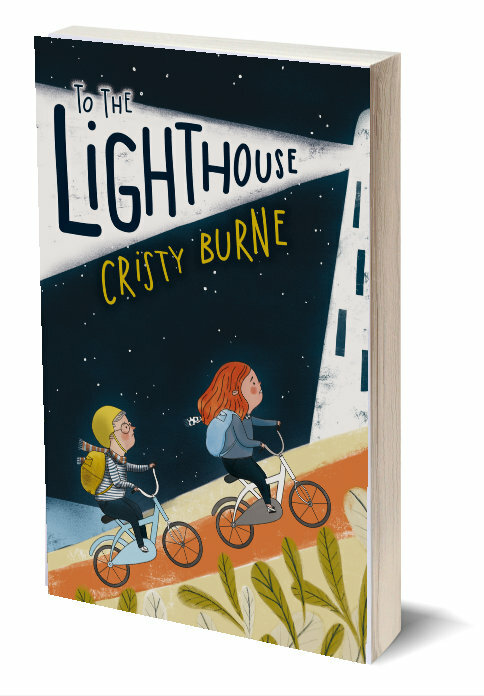 I wrote most of the book that became Too Much Trouble and various friends and colleagues commented on it as well as Chloe and my mum, a midwife who is a prodigious reader. I redrafted it several times and the Diverse Voices competition gave me a deadline to finish it and make it slightly shorter and more compact. How did you come to focus on the issues of gun crime and unaccompanied refugee children? In the places I’ve lived in and know about – Lewisham, Hackney and inner-city Birmingham – I became aware that these issues affected the lives of the young people I was meeting and I couldn’t ignore them. Like Emmanuel in Too Much Trouble, there are so many young people taking on responsibility that they shouldn’t have to deal with. What did you enjoy reading as a child and what do you like to read now? There were lots of books at home and I got lots more out of the school library. I remember Roald Dahl, Michael Morpurgo and the Allan Ahlberg poetry anthology I Heard it in the Playground. Later, I got into fantasy and enjoyed Ursula LeGuin and Jostein Gaarder. As an adult, I love Khaled Hosseini (The Kite Runner and A Thousand Splendid Suns) and all Nick Hornby’s books because his characters always seem real, tangible and organic: you aren’t aware of them having been written. As a teacher, I love exploring books with pupils and I’ve enjoyed reading Louis Sachar’s Holes and Frank Cottrell Boyce’s Millions to classes. What else do you enjoy about teaching? I like encouraging children in whatever their passion is and getting them to think about the world we live in. I thought about being an architect when I was in sixth form but I spent my gap year running youth groups for my church – my dad, a maths teacher, had run the children’s group when I was younger and I had helped with that and enjoyed it – and I realised then that I loved working with young people. 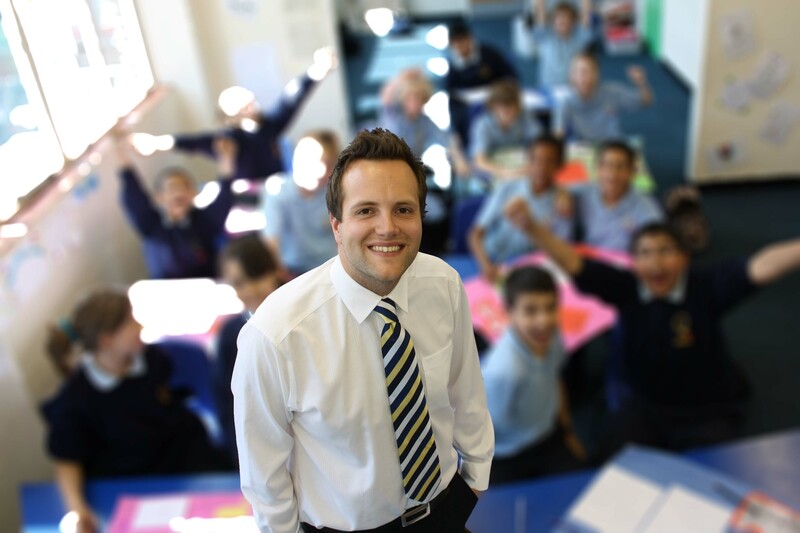 I trained as a primary teacher and spent two years teaching Year 4 and 5 in south-east London before my current job at Queensbridge. It’s a very diverse school: half the children do not speak English as a first language and there are 17 languages spoken in the school. My main role is teaching a cross-curricular unit of work for Year 7s called: ‘How much freedom do you have?’ We look at religious freedom, freedom of opportunity, discrimination, equality, protest and so on through English, history, RE, citizenship and geography. There’s a lot of scope for creativity. Tags: diversity, Frances Lincoln, interview, multiculturalism | Permalink.